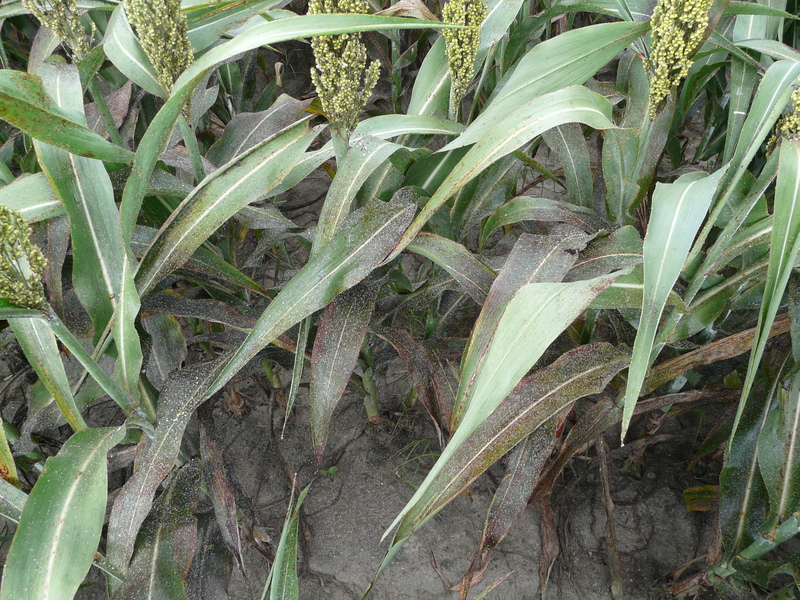 We looked at some bronze sorghum yesterday that is approaching milk stage. The heads have not expanded yet. This sorghum is definitely holding out for a rain which will help advance it a little more. We did get rain across much of the county yesterday. 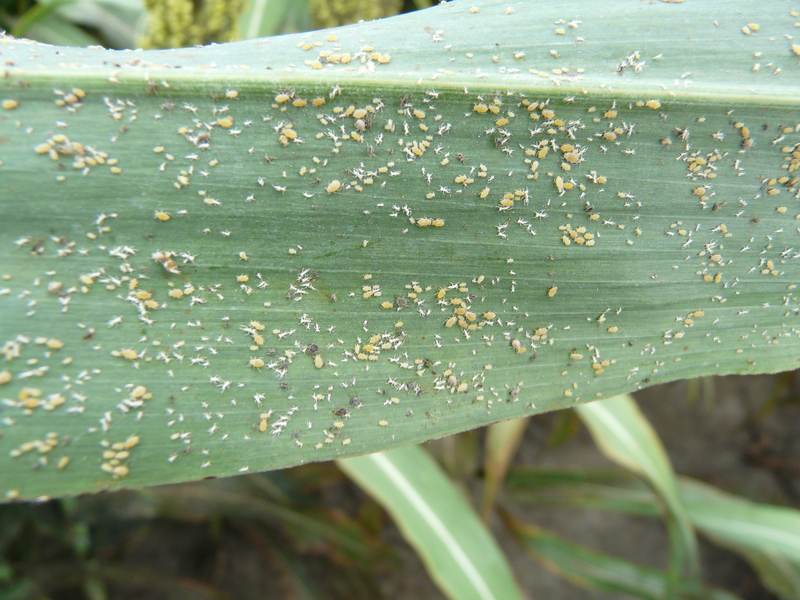 Sugarcane aphids are now in the heads, and we can still see yield loss until hard dough stage. There are lots of lady bugs present, but beneficial cannot handle these populations of the aphids. SCA can hurt us when we harvest. You will notice the honeydew on the leaves. SCA are up to the top leaves in this field. Lots of honeydew present and you can smell it too. Sivanto Prime (Bayer Crop Protection). 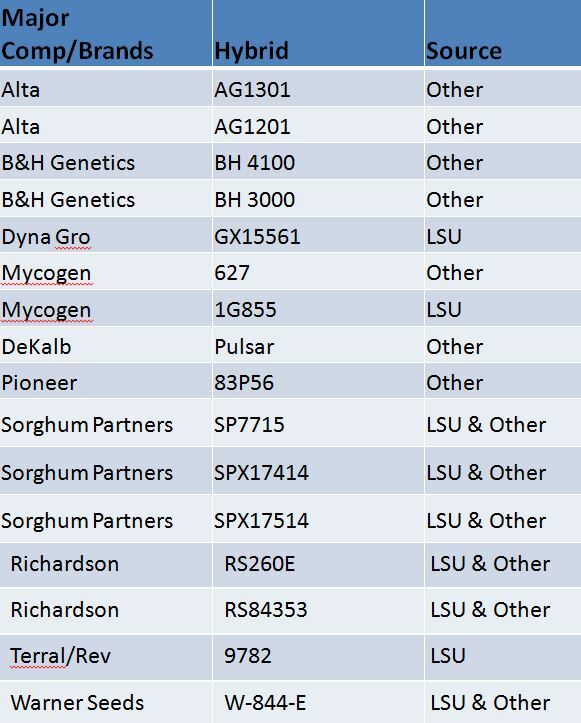 Sivanto prime has a full section 3 label and a supplemental 2ee label for lower rates on sorghum and other grain crops. The rates are 4 – 7 fl. oz per acre. Sivanto was very effective in my trials at rates of 4 to 7 fl. oz. 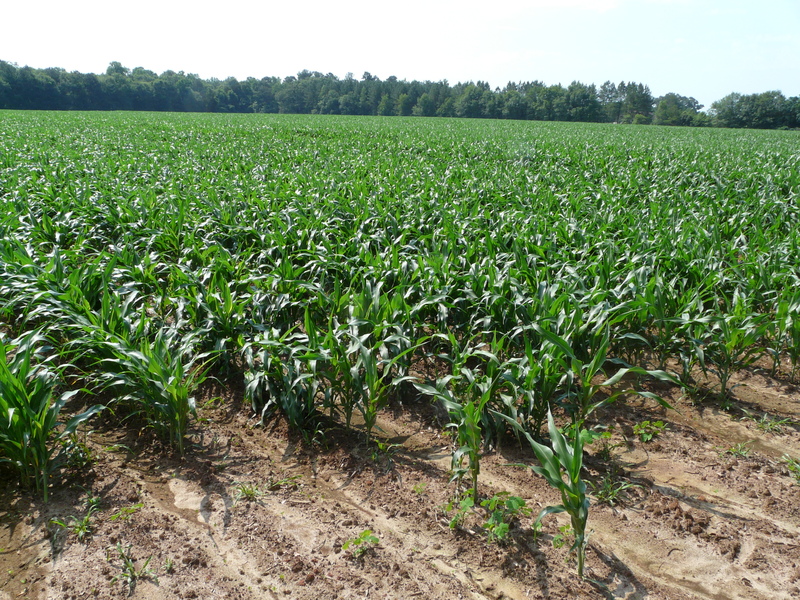 per acre with Control usually lasting 21 days or more. At the 4 oz rate it can be applied up to 7 times during the season but has a 21 day PHI. Transform WG (Dow AgroSciences). Transform WG federal label was vacated last winter and a new federal label has not been approved yet. 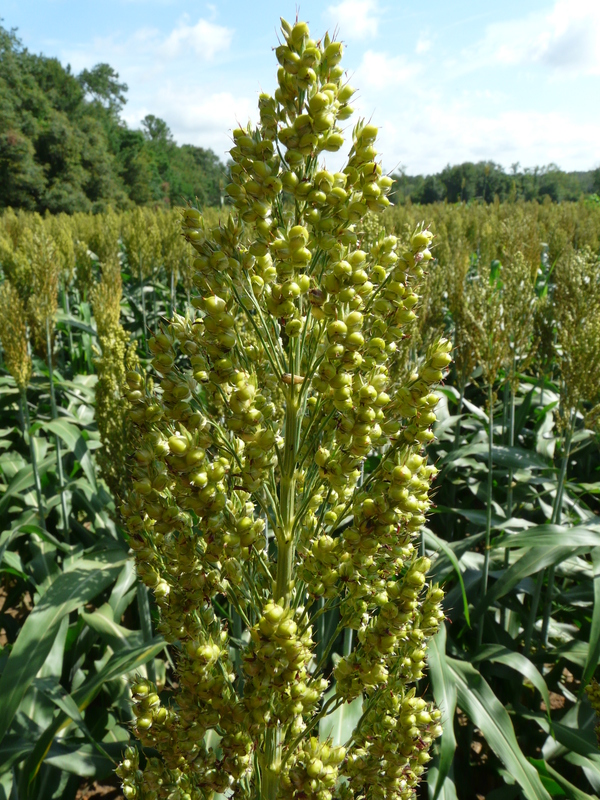 But Transform WG has an approved Section 18 emergency exception for use on sorghum in Georgia in 2016 through April 8, 2017. The big label change for 2016 is Transform cannot be used during bloom to protect pollinators. The label allows for 2 applications per season and not more than 3 oz per acre per crop and has a 14 day PHI. In my insecticide trails last season, rates of 1.0 and 1.5 oz per acre were effective. 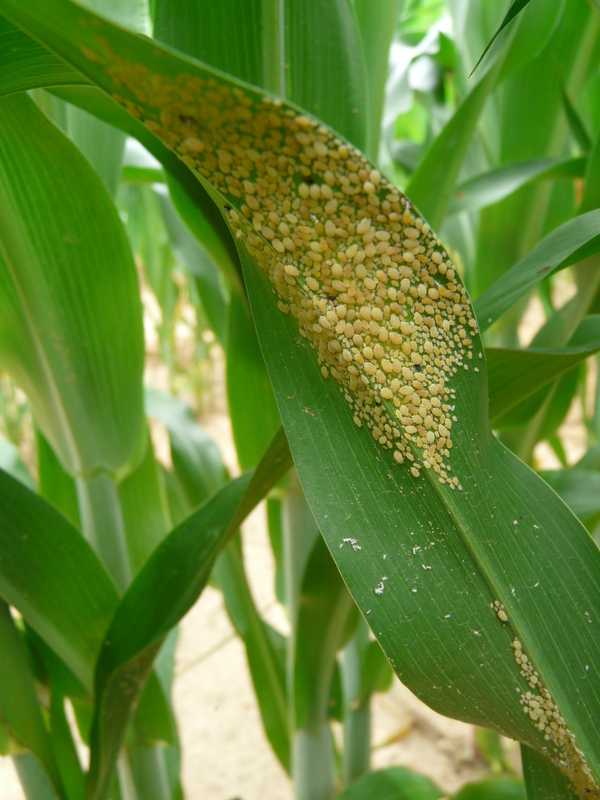 Use the 1.5 oz rate if aphid populations are increasing rapidly. Chlopyrifos (Lorsban Advanced, Nufos, other). Lorsban is labeled at 1 to 2 pints per acre. The 2 pint rate has a 60 day harvest interval. The 1 pint has a 30 day harvest interval, but is usually not effective. The 2 pint rate was 60-90% control for up to 2 weeks. 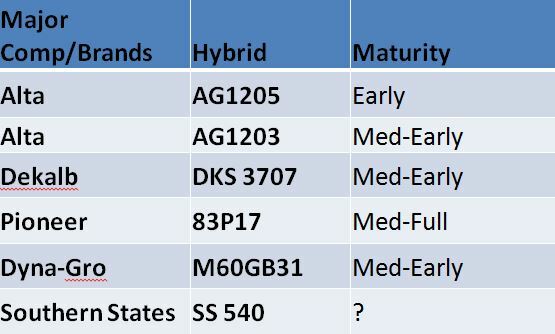 At the 2 pint rate it cannot be used after the boot stage due the 60 day PHI. 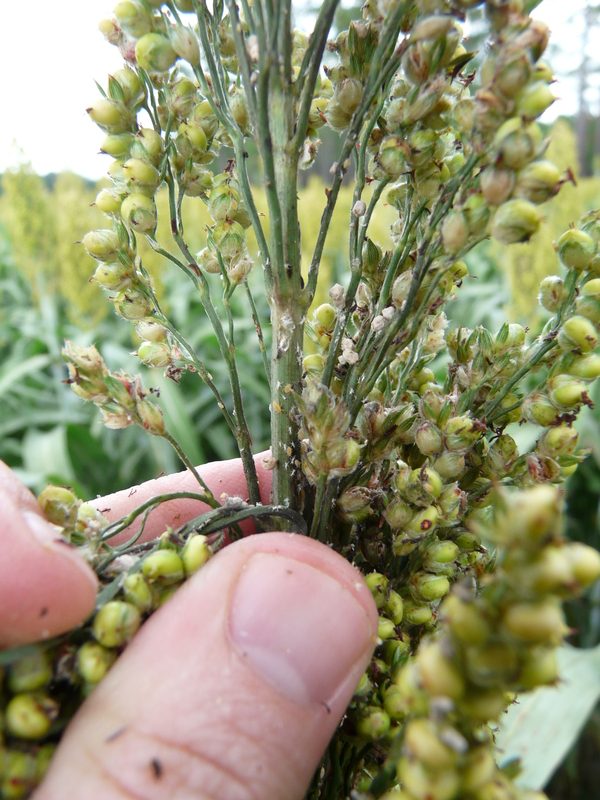 DO NOT USE CHLORPYRIFOS ON SWEET SORGHUM. “White spots” are cast skins from SCA. Blue colored aphids were parasitized by Aphelinus wasp. 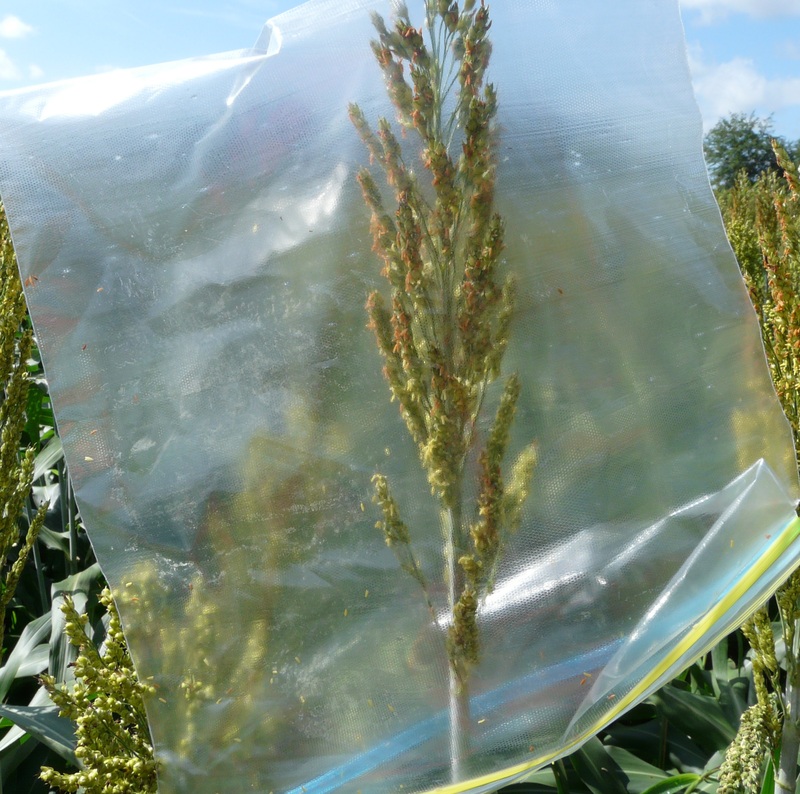 Grain Sorghum Dough Stage: Terminating Insect Sprays? Our grain sorghum is past flowering and moving through the soft dough stage. Grain fill is rapid with about half the total dry weight of the grain accumulating during this time. We may see nutrient stress and leaf loss since mobile nutrients are transolocated from the lower to the upper leaves. Between soft dough and hard dough stage, irrigation increases yield by improving grain fill test weight. We don’t see much if any response from water once grain reaches hard dough stage. Once we get to hard dough stage, color, we no longer have to worry about sugarcane aphids. 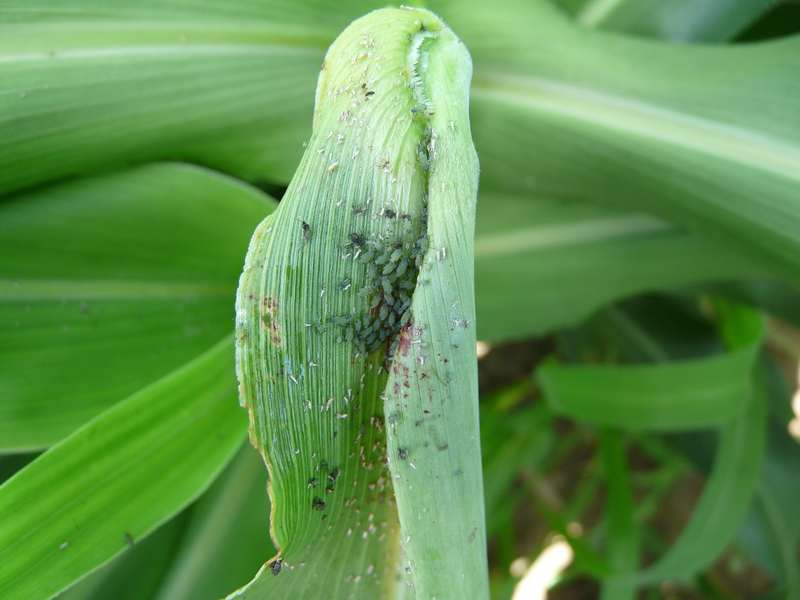 Also, keep in mind should try to avoid using pyrethroids for other insects and aphids. We need to check fields 2 – 3 weeks before harvest. We had issues with honeydew from SCA messing up the combines. A treatment may be needed if large numbers are in the head to prevent damage to combines. Hybrids with taller stalks and more space between the grain and upper leaves may make harvest easier by reducing the amount of leaf material going through the combine. Large infestation producing large amounts of honeydew and sooty mold may interfere with harvest desiccants. 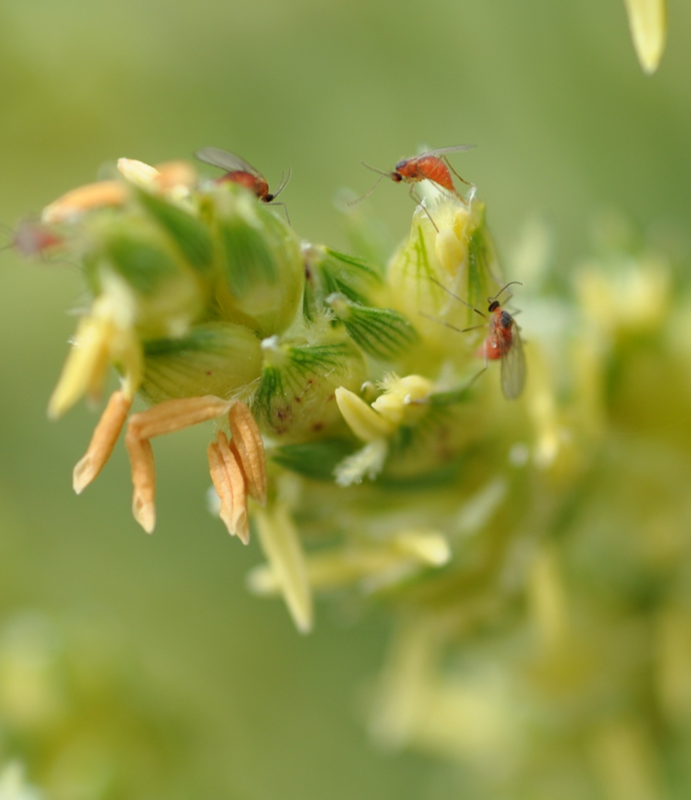 The susceptible damage period for midge is bloom. Treatment after bloom is too late. The adults are hard to find. We either put a plastic Ziploc bag over the head. The midge will fly to the top of the bag. You can also use a white paper plate, but the midge can fly off. If it’s wings are wet in the morning, it may not fly as well. In either case, we only treat when an average of 1 adult per head is observed after 25 – 30% of heads are blooming. We can treat again 5 – 10 days later if midge is present. 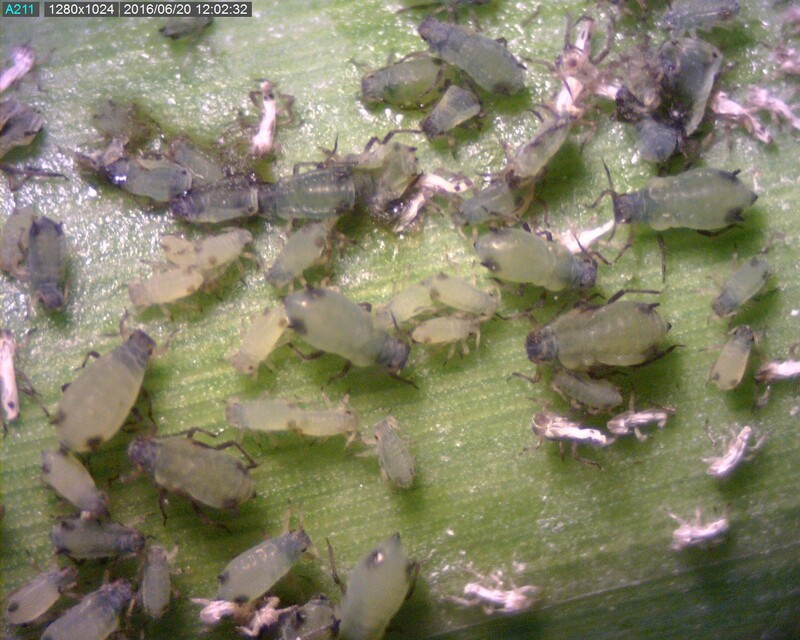 The eggs and larvae cannot be killed inside the glumes with insecticide. NOTE: For midge, try not to use a prethroid because it may flare sugarcane aphids. If SCA are present and pyrethroid is used, we would have to tank mix with Transform or Sivanto. 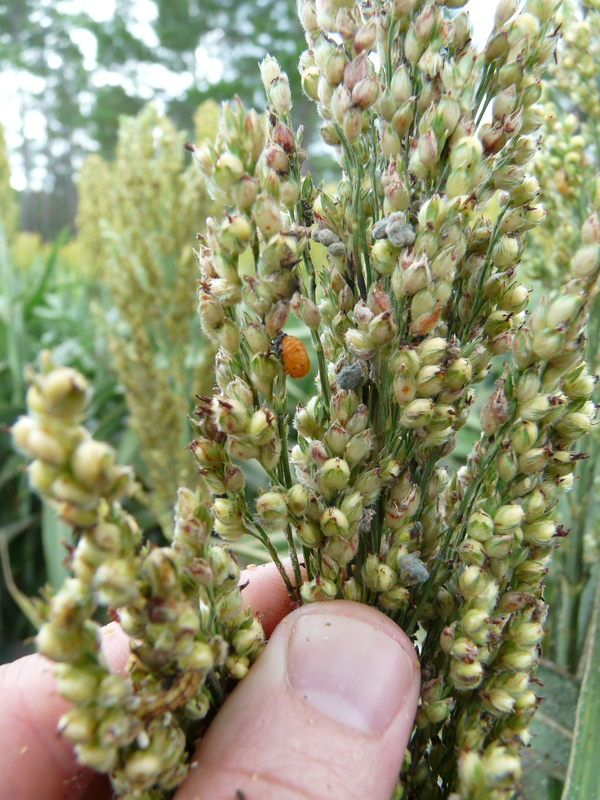 On Wednesday, Stephanie Holliefield in Brooks County confirmed sugarcane aphids in grain sorghum. I got calls from two growers in Thomas County today reporting SCA also. In both fields reported, no honeydew is present. Last season, we observed that once honeydew was present on the top of leaves, populations spread fast. Here is a picture of an adult and immatures under a leaf in a field today. 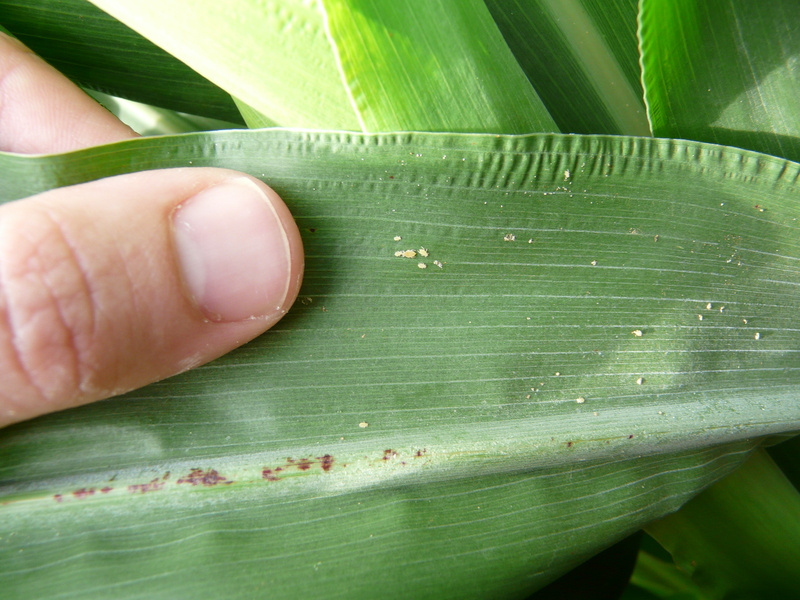 At pre-boot, we really don’t treat until 50-100 aphids are found in 20% of the field. Last season, we found ourselves pulling the trigger later than we should have. Each situation will be different. It can be difficult to asses. 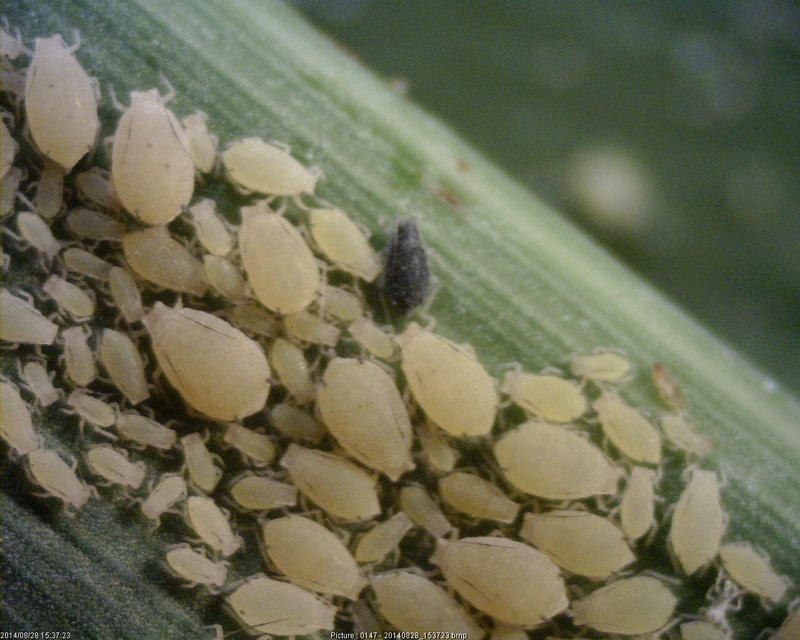 We need to remember that if aphids are present in one corner of the field, they may be present in another corner, and in another spot. Sivanto Prime – can be applied at 4-7 oz/acre. The 4 oz rate will do a good job and last for at least 21 days. Sivanto Prime last a little longer than Transform. 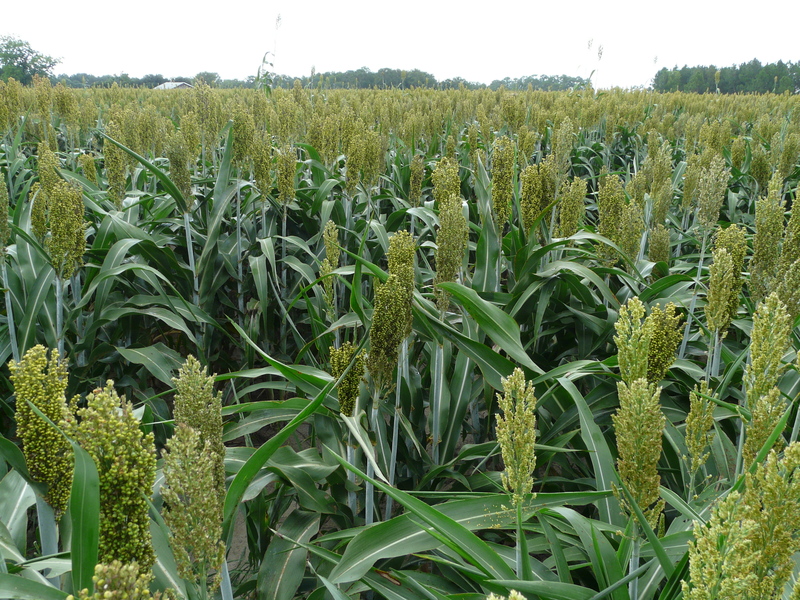 This product is full labeled on sorghum with a supplemental label for the 4-7 oz rates. Transform WG – has been approved again by a Section 18 for Georgia, at the 0.75 to 1.5 oz rate/acre. However, one big change from last year is Transform CANNOT be used during flowering. Also, we need to remember that there are only 2 applications per season. 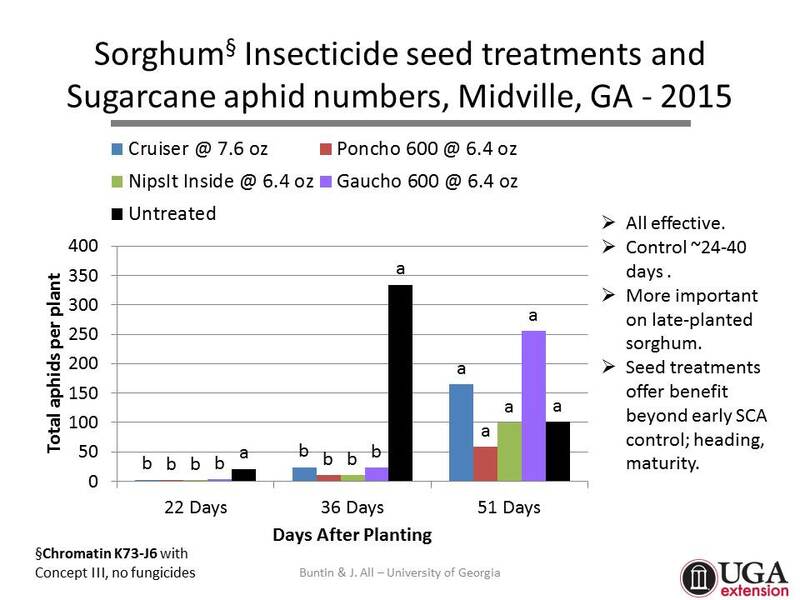 Dr. David Buntin, UGA Entomologist recommends at least the 1 oz rate and the 1.5 oz rate is even more effective and will provide approximately 14 days of control. Both of these products can be used on grain, silage, forage type sorghums, and sorghum/sudangrasses. But please remember that these products can not be used on sweet sorghum.